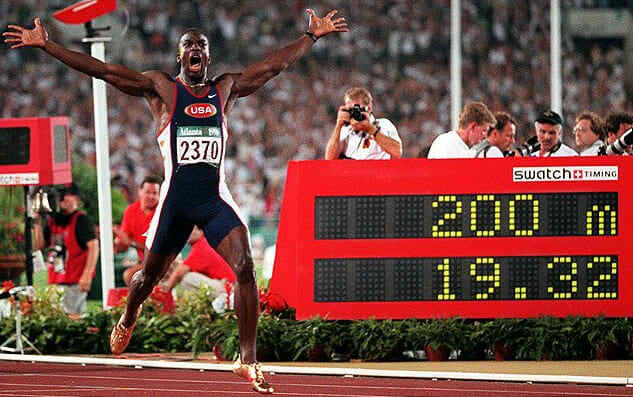 Michael Johnson had all of America cheering for him as he won two gold medals at the 1996 Olympics in Atlanta, and nearly everyone was paying attention to what was on his feet: a pair of gold Nike track spikes. 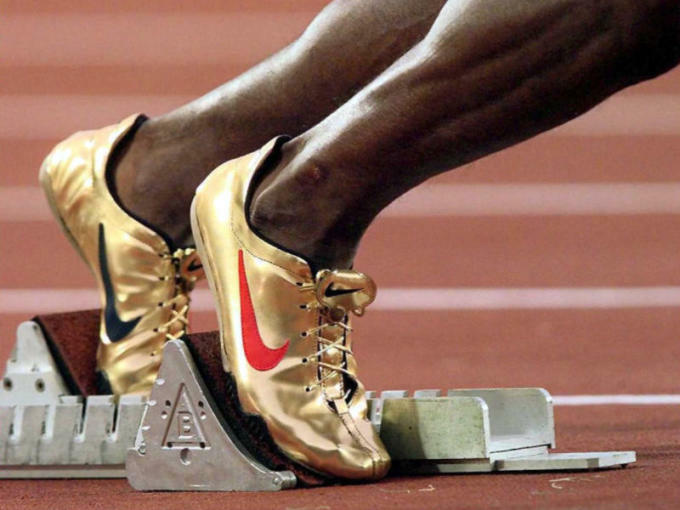 He ended up getting the nickname “The Man With the Golden Shoes,” and Nike decided to cash in on Johnson’s fame with a pair of lightweight training shoes called the Zoom JST, a sneaker version of his JSC track spike. 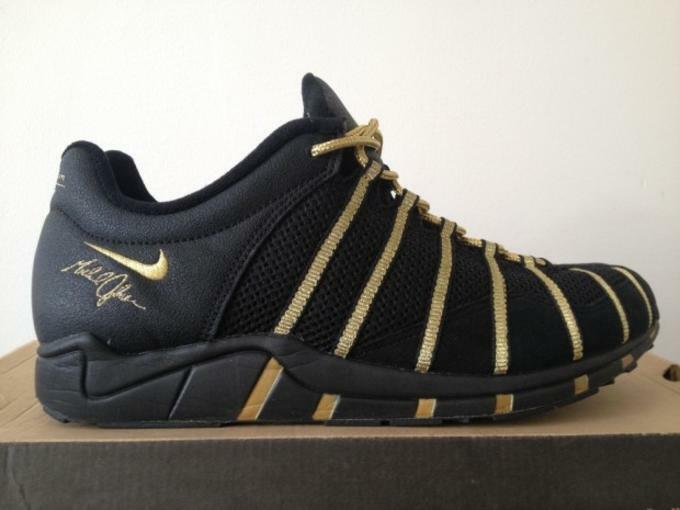 The black shoes with gold stripes, released in 1998, have become something of a legend amongst footwear connoisseurs. They’ve never been re-released and are hard to find on the secondary market. And the pairs that can be found may crumble with one wear, making Johnson’s sneakers a piece of fading Nike history. With the Olympics set to take place in Rio de Janeiro this summer, there’s a new crop of athletes looking to make history like Johnson. To celebrate the upcoming games, he was at a Nike Olympic event in New York City the other night, and we had the chance to talk to him about his golden shoes, forgotten Nike sneakers, and a recent Nike collaboration that looks pretty similar to his own JST shoe. 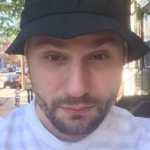 Your sneaker, the JST, has become a thing of legend amongst niche sneaker collectors. How did that whole shoe happen?After the gold shoe project, we decided that we should make a sneaker. The process was fun, because we didn’t have to worry about the technical aspects and how it was going to perform, like we did with the spike. [The spike] had to go through a lot of trials, because we wanted it to look cool, but we had to make sure it performed right. The sneaker was a lot of fun, because it was all about the look of the shoe. We wanted to have some gold elements to it, so it was a lot of fun to do. Do you still have any pairs left? Yeah, I still have some. I have some that I never wore. Afraid to put them on your feet? Yeah, because then there’s no more. Do you hope Nike will retro the shoe? Have you spoke to them about it? It would be cool to bring it back. Maybe one of these days, they’ll bring it back. Was there ever any talk of Nike making a second sneaker for you? No, I retired a few years after that. So it was just that one. 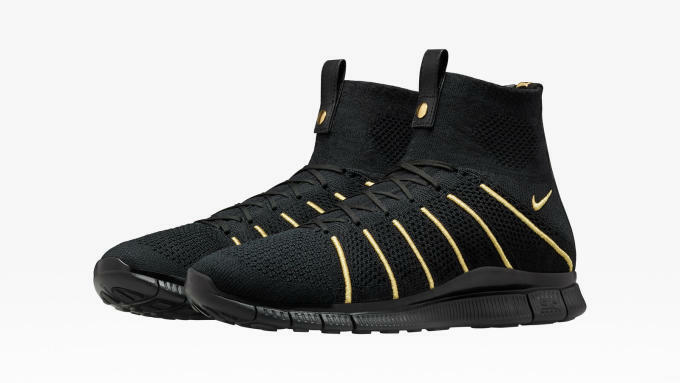 Did you see the recent Olivier Rousteing x Nike sneaker that looks just like yours? That does look like it. That’s it! When you did the gold track spike, did you know it was going to be that color? No, it wasn’t gold at all in the beginning. It wasn’t about the color, it was about the actual shoe. I had been wearing a spike plate—and this was almost 1996—that was made back in 1984. Shoes had advanced, but I was wearing it because I liked it so much because it was lighter. It worked with my foot a lot better than what Nike was currently making. So they came to me and were like, “Look, we want to make what you want, so tell us what you want. We’ll just start from scratch.” That was music to my ears. We started on the process about a year and a half before the 1996 Olympics. The idea was to make a shoe that was revolutionary, because I wanted something really lightweight and something with amazing support. I wanted it to work with my foot and the way my foot interacts with the track. I wanted to feel the track. We worked on that for quite some time. Then we worked on the upper with a lot of materials and fabrics, which were really cool and revolutionary. One of the last prototypes was a fabric that was just like the gold, but it was a mirror. It was metallic-like, but it looked like a mirror, you could see your reflection in it. That’s the one I wanted, and my coach didn’t like it. He said, “The mirror effect is going to be lost, and it’s going to look just like a silver shoe. That’s how I decided it was going to be gold. The idea that it was going to be gold was not the original idea. It came about in the very last minute after designing that shoe for a year and a half. Do you attribute any of your success to the shoes? Absolutely. As a sprinter, it’s your only piece of equipment, so it’s extremely important and it needs to work for you. That’s the reason I had been using the old spikes, because that’s the one that worked for me. There’s a tremendous amount of confidence you get knowing that this one piece of equipment that I have, I built it, I designed it to be what I want. What’s your go-to Nike sneaker right now? I’m all over the place, man. It ranges. I love the [Zoom All Out Flyknit], they just came out. But it depends on what I’m doing. I wear sneakers to dress up or when I’m training or going for a run, so I’m all over the place. How many pairs do you have back at the house? Not that many. I’m not a collector. I go through a lot, so at any given time I might have 30 pairs or so. I cycle through them a lot because I wear them.